The only way that this is not a completely late post is if I get it posted this week, but this has been growing on my heart since mother’s day and I still wanted to put it out there. 1) If my mom was still alive she would not be on Facebook anyway, or she would be one of those people who just uses it to stalk others and never posts anything herself. My mom, one of the best supporters you could have in your corner did not like being the center of attention and I think would have cringed at some of the narcissistic ways that self-promotion has exploded in the seven years since she passed away. 2) My mom did not like pictures of herself. That is in truth what got this whole post started in my head. Just like many of you, I spent most of Saturday and Sunday reading many beautiful, some sappy, posts about wonderful mothers, posted alongside family pictures or pictures of moms when at various stages of their lives. My mom would have loved reading all of them, but would not have appreciated a picture of herself showing up on Facebook (refer to number 1 above). 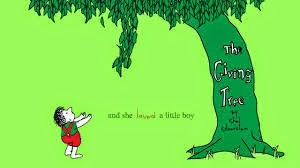 I could post a picture of one of mom’s favorite books, The Giving Tree. A book that she not only loved, but also, for so much of her life, embodied. Now, no one is perfect and my mom is no exception, but she was pretty amazing by all accounts, not just my own. Just as the tree in the Giving Tree gave away all it had for the boy it loved, so my mom continually gave to others, always assuming and seeing the best in them. It is an attribute that I try hard to copy even though I all too often fail. She was always ready to help, offer encouragement, and many times simply a quiet, “you are not doing as poorly as you think. You will make it.” to someone who needed it. I think that if I called her right now, amidst the many challenges that we are currently going through as a family that she would have similar words of encouragement. So I want to start a tradition. I will probably continue this tradition on her birthday from now on, instead of Mother’s day, but this is when it was born so it will start now. Besides, it is my tradition. Every year I want to award The Giving Tree Award to someone who embodies my mother’s spirit. The award will have no meaning whatsoever, expect to maybe me, and hopefully my family, and those who knew my mom. This year I want to give the Giving Tree Award to my wife. Not before everyone starts groaning from sentimentality or unfair rules, let me finish. In two weeks Liz leaves for the US to finish her master’s. This has been a work in progress that she started in 2010, almost five years ago. She has patiently pushed through and also selflessly put her studies aside for work, family, and even her husband’s master’s degree in the meantime. I finished my master’s degree last week after only two years of working on it, yet there were no hard feelings, only celebration. If she had wanted to ignore her call as a mother, missionary, or role as a wife she could have been done already, but instead choose to make sure that everyone else was taken care of first. Now that we are ready as a family and at a good place in our work she is returning to finish were she started. I think my mom would be proud and would have a few words of encouragement for Liz as well. So for this year, Happy Mother’s Day, and congratulations Elizabeth Soard, on The Giving Tree Award of 2015.